The American Bully was established within the United Stated in the 1990's. The breed originated from Virginia as well as California. Many dedicated breeders worked on the breed to create the perfect family companion. The American Bully breed was created with both American Pit Bull Terrier and the American Staffordshire Terrier, however, other bully and non-bully breeds were included as well in certain breeding lines. It was the belief that by combining the American Pit Bull Terrier and the American Staffordshire Terrier that qualities such as consistency, loyalty, friendliness, sociability and an upbeat attitude would be prominent. 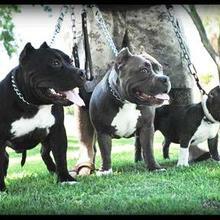 The American Bully is currently recognized by the following registries: ABKC, UCA, DRA, EBKC and BBC. The male American Bully can grow to reach heights from 18-21 inches while the female varies only slightly reaching heights from 17-20 inches. The American Bully can weight anywhere from 70-120 pounds. However, the weight of the American Bully can vary a great deal and is not heavily considered for the breed standard so long as the height and weight are proportionate. The American Bully's coat is short, smooth and glossy and should feel stiff to touch. The coat of the American Bully comes in a variety of colors such as fawn, chocolate, black, red and brindle variations. The only color combination not acceptable for the American Bully is Merle. The American Bully is a confident breed who is very loyal toward its family. They are courageous and have a very strong desire to please their master. The American Bully makes a great guard dog while at the same time a wonderful family companion dog. The American Bully must be well socialized at a young age to ensure that any dog aggressive tendencies are curbed. The American Bully is a confident breed who is very loyal toward its family. They are courageous and have a very strong desire to please their master. The American Bully makes a great guard dog while at the same time a wonderful family companion dog. The American Bully must be well socialized at a young age to ensure that any dog aggressive tendencies are curbed. The American Bully is an outgoing, good-natured and trustworthy dog. The breed is affectionate, gentle and loving and will make an ideal family companion. The American Bully is a very brave and intelligent breed who's aim in life is only to please. The breed is known to be very tolerant and has been known to be perfectly content left alone with small children. Overall, the temperament of the American Bully is very pleasant. Just because the word 'bully' is in their name, doesn't mean they throw their weight around. But they are highly protective of their owners and their owner's property, and will fight to the death to protect them if provoked. You can find American Bully puppies priced from $200 USD to $10000 USD with one of our credible breeders. Browse through our breeder's listings and find your perfect puppy at the perfect price. The American Bully is an outgoing, good-natured and trustworthy dog. The breed is affectionate, gentle and loving and will make an ideal family companion. The American Bully is a very brave and intelligent breed who's aim in life is only to please. The breed is known to be very tolerant and has been known to be perfectly content left alone with small children. Overall, the temperament of the American Bully is very pleasant. Just because the word 'bully' is in their name, doesn't mean they throw their weight around. But they are highly protective of their owners and their owner's property, and will fight to the death to protect them if provoked. The American Bully can do well in small quarters as long as they are well exercised. They are active indoors and out and will require space to play. Due to their short coat, the American Bully is an easy dog to groom. They require regular brushing with a firm bristled brush and only need to be bathed as needed. The American Bully is an average shedder. The American Bully will fair much better in a warmer climate where they can soak up the sun. If you want your bully to have that glossy look rub their coat hair with a either a chamois or a damp wash cloth. The American Bully is a very intelligent breed that will learn quickly. They want nothing more than to please their owners, making them quick to take orders. Once established, the American Bully is fully capable and willing to follow the rules. However, the American Bully needs a firm, consistent, calm and confident owner who is able to establish their dominance in the Pack order. It is imperative that the dog is aware that the humans in the household outrank him. The American Bully may have been built for mass, but it is an athletic breed as well. They require plenty of exercise on a daily basis, including a brisk walk. They can expend a great deal of energy with outdoor play as well. The American Bully will build up physical as well as mental stress if not exercised properly which, like any breed, can lead to destructive behaviour in the home. American Bully Puppies for Sale - Shipped Worldwide! Finding the right American Bully puppy can be dog gone hard work. PuppyFind® provides a convenient and efficient means of selecting and purchasing the perfect American Bully puppy (or American Bully puppies) from the comfort of your home, 24 hours a day, 7 days a week. Take advantage of our PuppySearch or leisurely browse our directory of hundreds of dog breeds, American Bully dog breeders, American Bully dogs for adoption, and American Bully puppy for sale listings with photos and detailed descriptions. Some American Bully puppies for sale may be shipped Worldwide and include crate and veterinarian checkup. Many American Bully dog breeders with puppies for sale also offer a health guarantee. With thousands of American Bully puppies for sale and hundreds of American Bully dog breeders, you're sure to find the perfect American Bully puppy.